In 1972, artist Alex Grey began to realize a series of art installations/performances dealing with themes including death, transcendence, and transformation. As recession began to take hold and the Cold War intensified during the first years of the 1980s, Britain and the U.S. elected reactionary, hawkish leaders, and fears of imminent nuclear war spread. 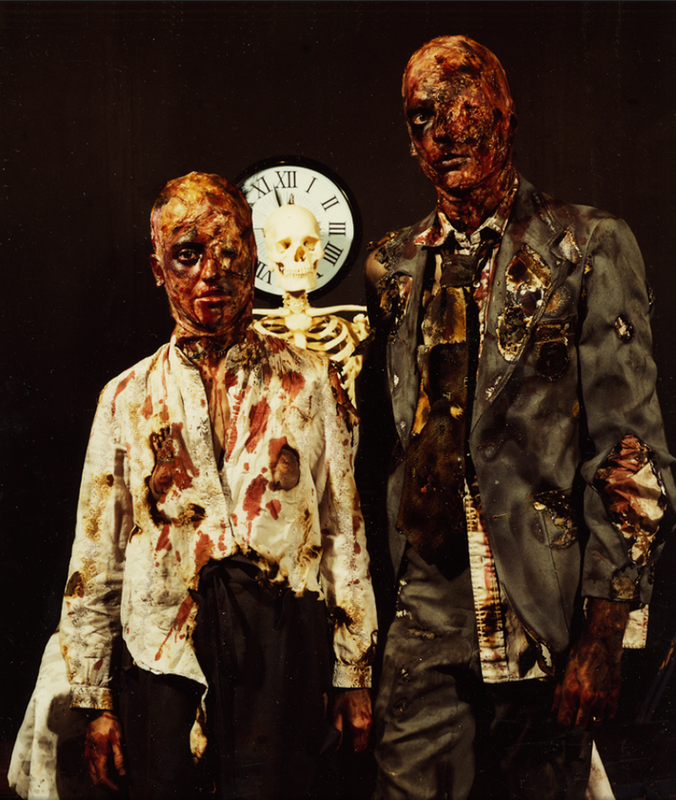 Grey examined the dire mood in a 1980 painting called Nuclear Crucifixion, followed by a more personal and graphic piece, 1982’s Wasteland. 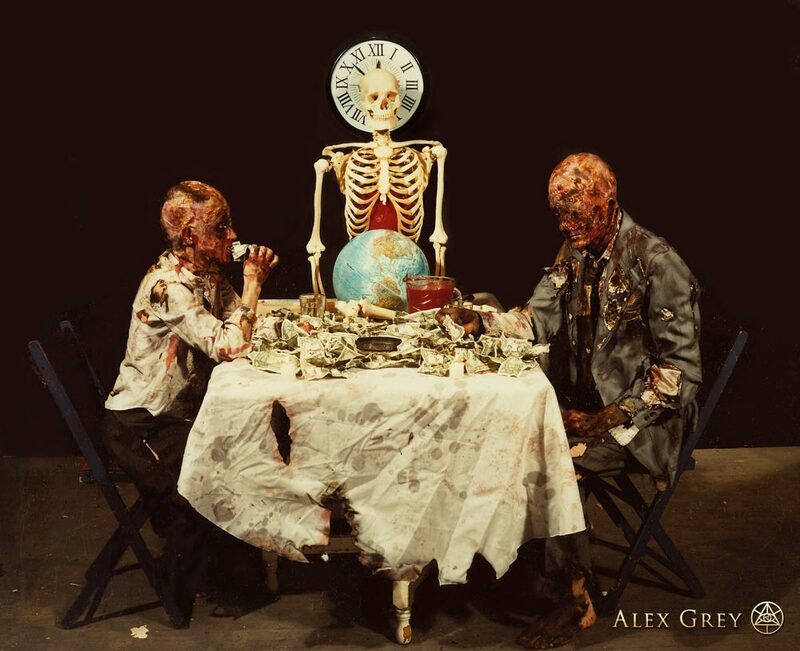 Wasteland was performed at Montreal’s Vehicule Art, a “non-profit, non-political centre directed by and for artists,” and featured Grey and his wife Allison playing Mr. and Mrs. X, a couple who are taken unawares by a nuclear blast while on their way to dinner and find themselves sitting down to eat banknotes and drink blood at a table in hell. After vomiting up the money, Mrs. X moves the clock back from four minutes to midnight—the position in which the doomsday clock of the Bulletin of the Atomic Scientists currently stood—to seven minutes to midnight, the time it had showed before the election of Ronald Reagan. Grey, who got his start teaching anatomy for artists and figure sculpture at New York University, began to experiment with psychoactive substances after meeting his wife, artist Allyson Rymland Grey, in 1975. This, combined with the five years he spent preparing cadavers for dissection at Harvard Medical School, led to the paintings for which he is now perhaps better known: vividly-colored, visionary artwork that has been featured on the covers of magazines ranging from Newsweek to Gnosis and graced album covers by artists including Nirvana and Tool. His Sacred Mirrors series of paintings is housed in its own chapel—Entheon—which is sited on the grounds of the guest house the Greys manage in New York’s Hudson Valley.